There are several methods that are available for fabricators to cut sheets of metal like carbon steel, nickel alloys, stainless steel and reflective metals like brass and copper. Some of the most common methods include laser cutting machines, Electricity Discharge Machining, Water Jet cutting, and Chemical Machining. This article will focus on precision cutting of metal blanks using laser cutting technologies which is becoming a preferred method for metal part manufacturers. The laser cutting processes today are highly versatile, programmable to adhere to tight dimensional tolerances and can handle short runs as well as high volume production. When it comes to controlling costs, minimizing waste and reducing ones carbon footprint, a fiber laser cutting of metal sheets appears to be emerging as the champion in laser cutting technologies. Metal fabricators can now utilize the digital design files sent from mechanical designers and CAD technicians and feed them directly into the programming software of the laser cutting machines. This reduces an operators time dramatically while speeding up production. 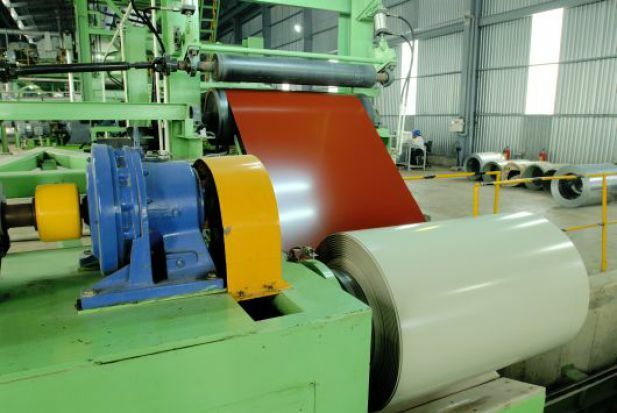 Pre-painting and coating steel plates prior to fabrication is an automated process and the costs involved with coating steel sheets are by far more economical than coating metal parts post fabrication. The challenge is fabricating metal parts without damaging the finish of the pre-coat being used. CO2 lasers will often scar the surface of the metal of both coated and uncoated metal sheets. The damage caused will depend upon the focus of the laser beam and the chemical makeup of the coating that was applied. Fiber lasers on the other hand do not cause much scaring if any at all. On occasion, fabricators will use an assist gas to minimize any scaring and help preserve a smooth finish on the material. We have noted cases where the PVC coating applied to steel sheets was mixed poorly and the application process was poorly done. This caused a melting of the PVC and debris floating in the air contaminated the metal blanks while producing a rough finish along the cut edges. The coating can also lift during the cutting process due to the poor adhesive properties of various coating materials. If the assist gas is not properly regulated, it too may damage the PCV and cause it to bubble up. So most of the problems we have encountered were related to the coating material’s negative reaction rather than the quality of the laser’s ability to cut a coated metal surface. In conclusion, fiber laser cutting machines are superior to most CO2 laser metal cutting machines when your steel plate is pre-coated with paints and some specialty coatings. It is also more cost effective to pre-coat flat metal sheets prior to shipping them to a metal fabrication company rather than coating a metal part post fabrication. Seek out a metal fabrication shop that offers fiber laser cutting services if you are looking to save on per part costs if powder coating is part of your current finishing process.